I’m a nail polish junkie and have been collecting nail polishes for years. It’s not often that you will see me without my nails painted. I wanted to share my five favourite nail polishes for winter this year. They are all by OPI as that is my favourite brand and is the only brand I’ve been buying lately. This list isn’t in any particular order. If I have pictures of me wearing the polish I’ll put it up. My nails are currently trashed from removing my gel manicure today so I will get pictures next time I wear each polish and add them to this post. 🙂 Hopefully should wear them all within the next few weeks. This polish is from the 2013 Limited Edition Euro Centrale Collection. This is one of my all-time favourite nail polishes and I don’t think you can get it in stores anymore but you can find it on Amazon. Eurso Euro is a deep blue colour that leans a little purple. It’s not too dark, and is perfect for fall and winter. I don’t own anything like it and it makes me want to get more blues to add to my collection. This is my newest nail polish, I wanted some more reds for winter so picked it up. I was unsure if I should buy it because I could see some shimmer in the bottle but it’s a great colour! It’s a red obviously, not to dark and not too bright. It wasn’t the colour I was hoping it to be, I wanted a classic red but I still love it and have worn it a few times already. I think I’ll pick up Big Apple Red next time for a true red as OPI Red has a slight pink tinge. But like I said, I love this colour and it really helps add some colour to the gloomy winter days. OPI Red goes on really smooth and opaque, you could probably get away with one coat. This polish is from the Fall 2014 Nordic Collection and I suggest you go and buy it before they stop selling it. It is a gorgeous colour, I’m in love with it! 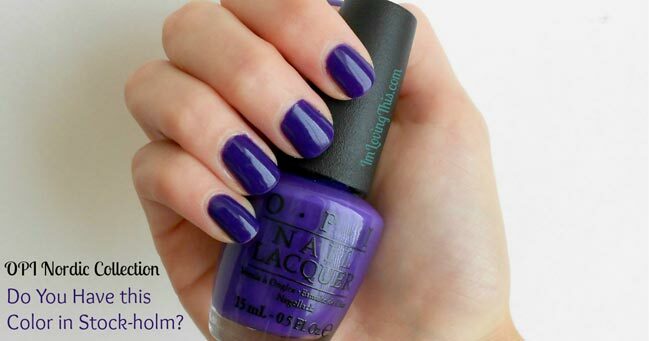 OPI Do You Have This Color in Stock-holm is a blue toned violet. The formula of this polish is also great, it is opaque with only one coat. I think I’m going to get another bottle of this before they stop selling them. Also, if you want another beauty from the Nordic collection then make sure to pick up ‘Can’t aFjörd Not To‘, it’s gorgeous! I have a few deep reds and had a hard time deciding which one I liked more. I’ve used Quarter of a Cent-Cherry the most so I picked it. This polish is a deep red, it’s not too dark so you can still see that it is red. I love deep red nails, they make me feel so glamourous. Every girls needs this colour in their collection and I think it would be flattering on all skin tones. I believe that I still see this colour in stores but I’m not 100% sure so don’t hold me to it. If you can’t find that you could try Chick Flick Cherry or Got the Blues for Red. This colour is very popular, I hear people talking about it all the time. I really like to use bold colours on my nails but we all need a few neutral colours for certain times. This is a perfect one for the winter season. This colour is not too brown and not too grey and looks great with my untanned winter complexion. You Don’t Know Jacques! was originally part of OPI’s Fall 2008 La Collection de France but it is was so popular that they put it into their classics line. So you can still buy this in stores if you are interested. This polish was from the 2011 Holiday Muppets Collection and you can probably only find it online now. I actually received Rainbow Connection from my boyfriends Mom as a gift. I wanted to add this one to my post because I enjoy wearing this overtop of colours during the holidays. It’s a beautiful multi-colour glitter polish. I think that it adds that extra glam to my nails during the holidays. I’ve worn it over black before on New Years Eve and it looked awesome! 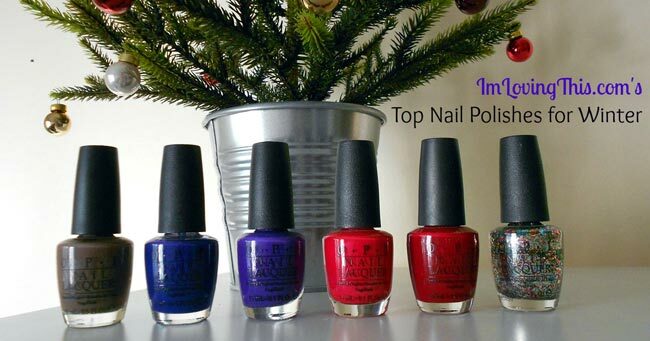 I hope you enjoyed my post about my favourite nail polishes for the winter season. I have an obsession with nail polish and often times my boyfriend thinks I like them more than him. What are your favourite nail polishes for winter? I’d love to hear! I hope to get my hands on some of the new polishes from the OPI Gwen Stefani Holiday Collection, some beautiful reds in that line.